Aquarium Granuloma, a skin disease that is commonly associated with aquariums is under-diagnosed according to a study presented at the Infectious Diseases Society of America's annual meeting in San Francisco. Aquarium granuloma is caused by the Mycobacterium marinum bacteria. The bacteria is a a non-tuberculous mycobacterium found in non-chlorinated water. Infection starts when an open wound on the arm or hand is exposed to the bacteria. The disease causes skin lesions and takes from 11 to 56 days to incubate. According to the study, patients with the disease may not associate it with aquariums because of the prolonged incubation period. 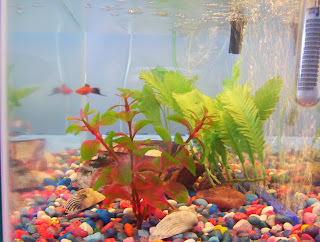 Also, people do not usually tend to think of aquariums being host to bacteria. This may lead to the patient not getting the appropriate treatment. Researchers say diagnosing and managing Mycobacterium marinum infection is difficult because skin lesions don't appear for two to four weeks after incubation, leading to delayed treatment and unnecessary and ineffective use of antifungal and antibacterial agents. During the incubation period, patients also fail to remember the source of the exposure, which is often traced to them cleaning their aquarium. Infection results when bacteria in the non-chlorinated water attacks an open skin wound on the arm or hand. "People just don't know or think about their fish tank harboring this bacterial organism," says George Alangaden, M.D., a Henry Ford Infectious Diseases physician and the study's lead author. "And unless they're directly questioned about it by their physician, who may or may not have adequate knowledge of Mycobacterium marinum and its prolonged incubation period, appropriate treatment often gets delayed." The study is being presented Saturday at the Infectious Diseases Society of America's annual meeting in San Francisco. In a retrospective study conducted between January 2003 and March 2013, researchers identified five patients ages 43 to 72 treated at Henry Ford for Mycobacterium marinum, which resemble reddish skin lesions or bumps on the hands or arms. Skin biopsies performed on all five patients confirmed the infection. The incubation period before skin lesions appeared ranged from 11 to 56 days. While all five patients responded effectively to antibiotic treatment, it took on average 161 days from the time of initial presentation to time of treatment.